The 28-story residence hall at 90 Sands Street in DUMBO is sparsely decorated; the large community rooms where hundreds of Jehovah’s Witnesses once gathered now sit empty. But give it a year’s worth of renovation work and developers say the building will provide permanent housing for hundreds of New Yorkers, many of whom are now living in homeless shelters. “We were jumping up and down, that’s true,” said Brenda Rosen, the president of Breaking Ground, describing the excitement at the acquisition. Thank You for Making This Year’s Project: Back to School a Huge Success! We would like to extend a huge thanks to all of the individuals, companies, schools, community organizations and volunteers who helped make the 11th annual Project: Back to School such a resounding success. This year’s drive kicked off with a volunteer event hosted by AIG. Their enthusiastic employees sorted and packed 1,000 colorful backpacks for kids of all ages in an astonishing two and a half hours! We were thrilled to partner with Manhattan Mini Storage for the eleventh consecutive year, and with Huntington Learning Center for the third year. They helped us immensely by widely promoting the drive and hosting drop-off locations throughout the city, making it easy for New Yorkers in all five boroughs to donate school supplies to homeless kids. 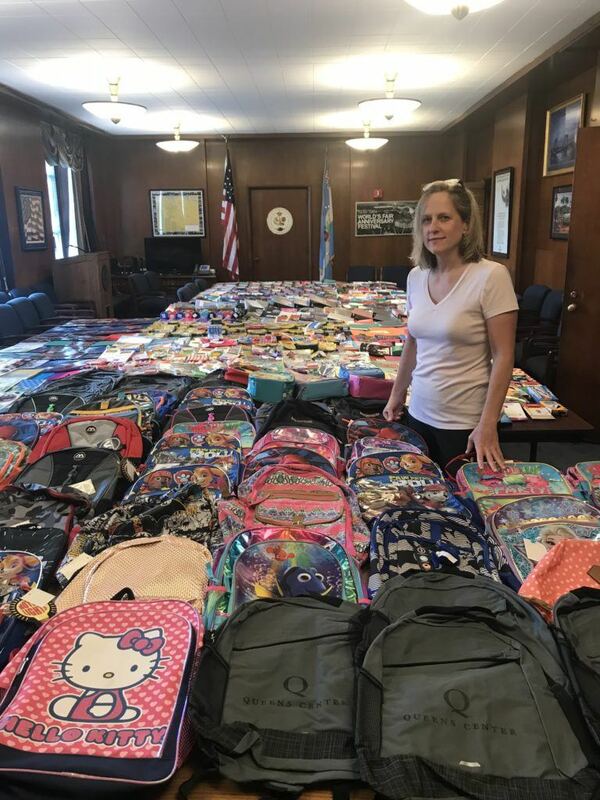 Queens Borough President Melinda Katz rallied members from the Queens community to donate hundreds of supplies and backpacks, and Congressman Eliot L. Engel hosted his annual drive in the Bronx. We are so grateful to see the communities come together to help these kids succeed in school! We were able to collect and distribute nearly 3,000 backpacks filled with school supplies like crayons, notebooks, pencils, and binders into the eager hands of the girls and boys who need them most. Through the dedication of so many compassionate New Yorkers, we got more bags to more kids before the first day of school than ever before! Thank you to volunteers from Condé Nast, Maximus, Information Builders and so many others who helped us get these backpacks packed and ready to go. Tonight alone, more than 22,000 girls and boys will sleep in NYC homeless shelters. These children are at a tremendous disadvantage compared to their housed classmates, and need all the help they can get to succeed in school. The gift of a brand new backpack filled with supplies can make all the difference in the world to a homeless school kid. Thank you so much for your continued support of Project: Back to School! On a recent weekday morning, the cafeteria of the Bergen House in Crown Heights, Brooklyn was quiet. Seated around long plastic tables, residents from the 104-bed homeless shelter for senior men played dominoes and chatted. One man built small figurines from wooden tongue depressors. The fluorescent-lit room was mostly bare, save for a few posters, a bulletin board, and a large, multicolored mural. Eighteen months ago, that freshly painted mural served as the backdrop to a much more raucous scene: a packed public meeting, the first held after news broke that the low-slung beige building, once a daycare, would become a homeless shelter. During the meeting, Crown Heights residents vented their anger and shouted down city officials and shelter representatives for hours.